90% of solar generating systems globally use c-si PV module, while the thin-film solar module has a certain market presence. EnergyTrend visited the Green Energy Expo and interviewed WonCIGS CEO Ding Seop Kim (Dr. Kim) in April to discuss the future development of copper indium gallium selenide (CIGS) solar products. WonCIGS has a strong R&D team including people who worked in the solar module R&D department at Samsung Electronics and Samsung SDI. Since 2008, WonCIGS has invested heavily in CIGS processing R&D. 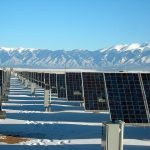 In 2013, those efforts proved to be successful as they finished the 231W CIGS module trial, providing a large amount of CIGS equipment for the global solar market. Ding Seop Kim (Dr. Kim) notes the c-si PV module production process is long and goes through multiple steps, including polysilicon, wafer, PV cell, and PV module. 85% of the cost is from raw materials. By comparison, the CIGS module is considerably less dependent on raw material suppliers even though 60% of its cost is derived from raw materials. Additionally, the CIGS module supply chain is more economical while production can be completed in one factory. The production process does not require polysilicon, which consumes a lot of energy, nor does it require wafer processing. 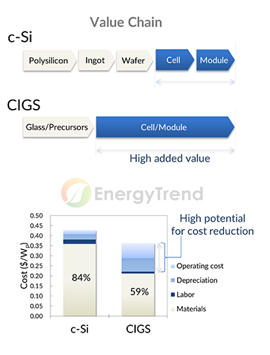 Currently, WonCIGS has reached a conversion efficiency rate of 16% for 230W CIGS modules. Dr. Kim pointed out that CIGS module performs better in high temperatures than c-SI PV modules. Additionally, Dr. Kim noted that since the CIGS manufacturing process requires less water, it is suitable for dry climates or developing countries that have yet to set up solar energy clusters. CIGS has not become a mainstream product because the production technology is hard to control, the module size is not standardized, and the cost is still high. Dr. Kim, who has been in the green energy sector for more than 30 years, knows that these obstacles are considerable. With that in mind, he and a panel company have worked together to develop the “CIGS Turnkey Solution.” The objective of this platform is to standardize the CIGS production process and reduce variables, finalize the size of CIGS modules and develop a high-efficiency model in order to achieve optimal results. Furthermore, WOnCIGS also hopes to resolve the challenges with the CIGS R&D and capotal disbursement problems by establishing a new business model. To do so, WonCIGS will build global partnerships to provide a low-cost CIGS Turnkey Solution, taking into account the issues encountered by companies in different locations, and finally developing integrated CIGS solutions with core technology for improving CIGS’ global market share. Dr. Kim hopes his CIGS Turnkey Solution can help CIGS to reach 30% market share in the near future, reaching economies of scale and further lowing costs and the selling price. If development goes smoothly, the price is expected to lower to US$0.21 per watt in about seven to eight years. 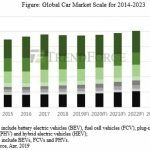 Furthermore, should CIGS increase its market share, the solar energy market would no longer be dominated by c-si PV modules. Rather, it would have more options and potential for solar energy applications. Currently, mass production of c-si PV module is easy. Production efficiency is high. The technology is largely used for large-scale ground-mounted solar power stations as well as those on roofs. Yet CIGs can perform better than c-si PV modules in situations where sunlight is weak. CIGS panels can absorb broader range of sunlight in light spectrum, and the technology is versatile: It is applicable on roofs and on the external surfaces of buildings. Additionally, given that developing countries often lack good water resources, CIGS can be a good option if you want to build solar energy installations in these regions as well as reduce trade wars and shipment costs. 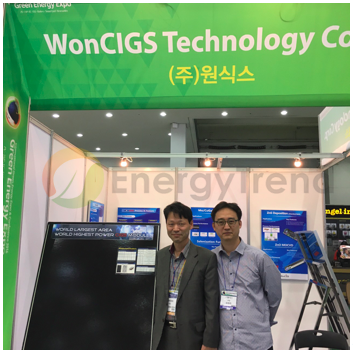 Ultimately, WonCIGS’s CIGS Turnkey Solution can be a key platform to broaden the use of CIGS technology in the clean energy market.